Linköping, Sweden – July 13, 2017 – International medical imaging IT and cybersecurity company Sectra’s (STO: SECT B) solution for medical education and clinical training, Sectra Education Portal, is now in use at the Amsterdam Center for Radiological Anatomy (ACRA). ACRA is part of the Academic Medical Center (AMC) in Amsterdam, the Netherlands. 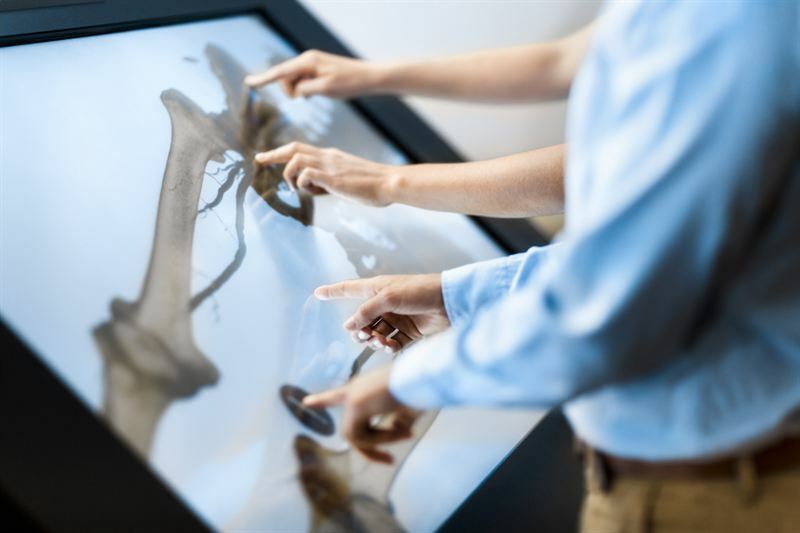 Sectra Education Portal and its interactive tools such as the Sectra Table provide teachers and students with virtual representations of real bodies rendered from clinical imaging. All medical students at the Amsterdam University Hospital will now be able to digitally interact with renderings of real-life medical cases, allowing for deeper understanding and insight into anatomy. To bring radiology and anatomy closer together, bodies used for medical education at Amsterdam University Hospital will now be scanned and rendered. Teachers and students will thus be able to access and interact with these cases repeatedly during their education. Through Sectra Education Portal, the cases can be shared with other portal users outside AMC and also be accessed remotely by teachers and students. This creates an international workspace in which users from all over the world learn from each other’s cases. AMC currently has around 500 existing full body CT cases and will use the solution for its approximately 150 new cases per year. With the possibility of repeated interaction with virtual representations of real bodies rendered from clinical imaging throughout their education, students, residents and medical professionals are able to gain deeper understanding and insight into anatomy, and the functions and processes inside the body. Easy access to all types of medical images, including 3D renderings, provides the ability to demonstrate anatomical variations and, in combination with the possibility to study multiple cases, this contributes to enhanced medical education and clinical training. With Sectra Education Portal, a cloud-based sharing portal, teachers and students have access to an extensive library of cases, providing them with a wide variety of clinical content. Through Sectra’s collaborative network, institutions can share cases and knowledge with other Sectra users from around the world.